Imagine the freedom of having a portable AC outlet. Energy on the go, anywhere you are. With our external battery you can power up practically any electrical device; a lamp, television, amplifier, hair straightener, printer, laptop, tablet, camera, blender, fan… even simultaneously using the AC outlet and USB port at the same time! The A2 S is more than a laptop power bank and not just a battery pack. The built-in lithium-ion batteries (similar to those in a Tesla) provide enough power to take your whole office on the road. The A2 S is the little sister of the A2, but nevertheless still very powerful. In combination with our handmade portable solar panels it’s the best off-grid solution to add to your travel kit! Increase your productivity! With our travel battery in your briefcase there’s no excuse left not to get things done. Be prepared for anything with your A2 S at hand. King of Powerpacks, the same innovative lithium ion battery technology as Tesla. 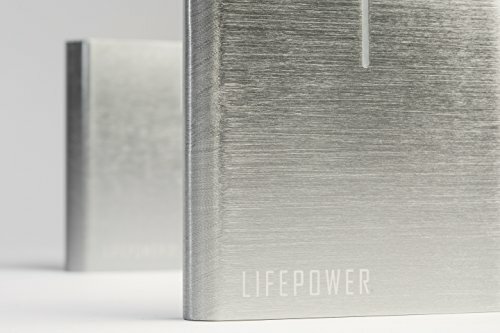 The Lifepowr A2 S packs a massive 77Wh (20800 mAh at single cell V level) of energy. POWERFUL AC OUTLET: built-in outlet with a maximum peak of 120W (100W continuous) allows you to use practically ANY DEVICE, ANYWHERE. PREMIUM QUALITY, top-notch design, finished with a brushed aluminum casing, ensuring a premium look & feel. If you have any questions about this product by LifePower, contact us by completing and submitting the form below. If you are looking for a specif part number, please include it with your message.